The Passo del Ghisallo is a famous cycling route that is occasionally featured in the Giro d'Italia, and almost always in the Tour of Lombardy. It is accessed most often from the town of Bellagio situated at the tip of Lake Como's prominent peninsula. 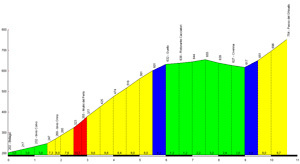 Ghisallo is a moderately difficult climb from Bellagio, but easier when ridden from either Erba or Onno. For an additional challenge, however, you can combine it with the nearby Muro di Sormano (the wall of Sormano) which is a short climb known for its incredible steepness (2kms at an average of 15%!). Fame comes not only from the Passo del Ghisallo's appearances in professional cycling stages, but also from the chapel and Museum situated at the pass's summit; both are dedicated to the sport of cycling. The chapel, called the Madonna del Ghisallo, was made the patroness of cyclists by Pope Pius XII, and the museum, the Museo del Ciclisimo, is the world's leading museum of cycling legends and memorabilia. If you're an avid cyclist, you really should take the time to stop into the museum. The classic approach to the Passo del Ghisallo is from the town of Bellagio. Depending on where you are staying, you can access Bellagio either by road or road and ferry. 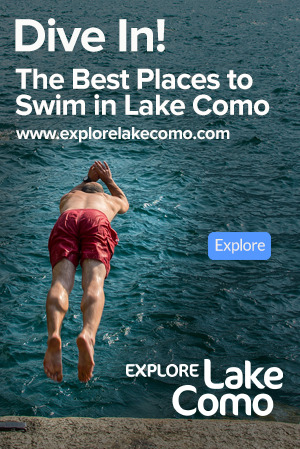 If you are staying relatively close to Como, the best approach is to cycle along the road on the east shore of the western arm of Lake Como which ends at Bellagio. Not only is this obviously the most direct route, but this is a beautiful section of Lake's Como's shore line road that has been recently repaved and has relatively little traffic. If you are staying closer to the middle or northern area of the lake on the western shore (i.e. such as near Griante), then you should cycle to Menaggio or Cadenabbia and take the ferry from there across the lake to Bellagio. If you are staying on the far eastern shore of the lake, you can cycle to Varenna and then take the ferry from there to Bellagio. Of course, in all cases there is also the option of cycling from any point on the lake around the shore in either direction until you eventually reach Belaggio, but for many, depending on where you are, this could be a very long ride, especially when combined with climbing the Passo del Ghisallo. From the Ferry docks in Bellagio proceed south on the main road that is along the lake (Via Lungolago Europa / Via P. Carcano) until you reach an intersection beside the Gardens of Villa Melzi. Here you will turn left (onto Viale D. Vitali) which will simply be a very short ride that crosses over to the other side of the narrow peninsula. When you reach the end of this road, turn right onto SP41 and stay on this road until you reach the Passo del Ghisallo. This section of SP41 goes by a number of names on the map depending on its specific section: Via Valassina at the bottom, Via Provinciale for most of the ascent, and then Via Adua as you get closer to the top. Do not stray off the main road, as it is the main road which takes you to the top. For the descent you have a few options. You can simply go back down the way you came up. You can descend down to Asso and Valbrona and then eventually back down to the eastern arm of Lake Como, and then ride along the lake shore back to Bellagio. You can descend down to Maglio proceed to Sormano and then climb up to the Colma di Sormano, either by the normal road or the extremely steep "Muro di Sormano" which is a path like deviation on the left side of the road when proceeding up the road called Via Muro di Sormanno. When you've reached the top you can ride over a plateau area called the Piano del Tivano and then descend back down to Nesso which is on the western arm of Lake Como and then ride back along the lake shore to Bellagio. 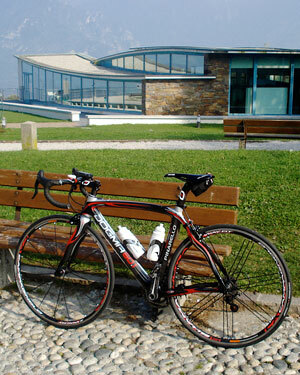 A Pinarello Dogma, the pinnacle of road bike technology, with the Museo del Ciclismo in the background. 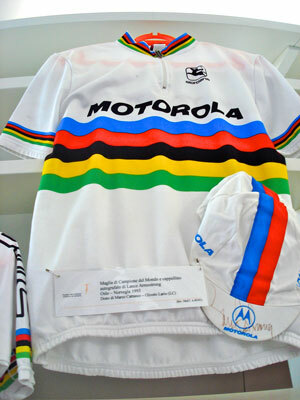 One of the many pieces of memorabilia at the Museo del Ciclismo: Lance Armstrong's winning cycling jersey from the 1993 World Championships in Oslo, Norway.